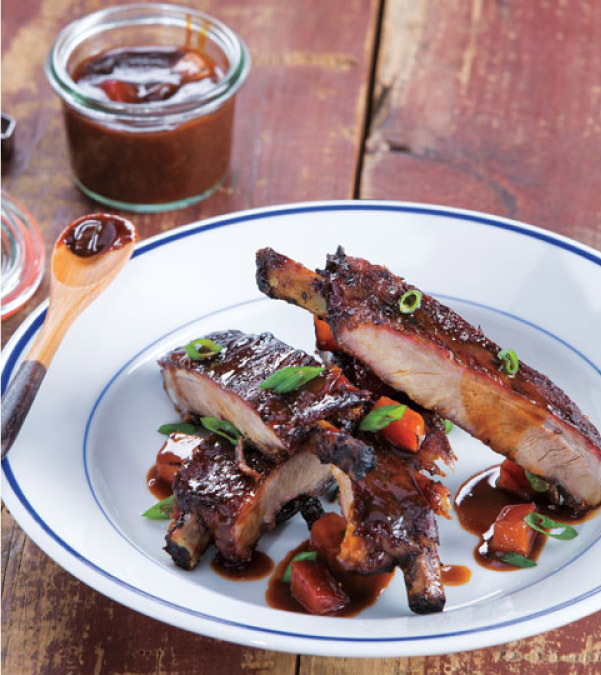 1.Prepare Ribs: In small bowl, combine garlic, soy sauce, sesame oil, chili garlic sauce, salt, ginger, cloves and mustard. Rub mixture over ribs; cover and refrigerate at least 2 hours or overnight. 2.Preheat outdoor grill with all the burners on high. Once preheated, turn off 1 of the burners for a 2-burner grill, or center burner for a 3-burner grill. Reduce remaining burners to medium low. Place ribs over unlit part of the grill; cover and cook 1-1/2 to 2 hours or until meat easily pulls away from bone, turning every 20 minutes. 3.Meanwhile, prepare Hoisin Plum-BBQ Sauce: Place plums over lit part of grill; cook 10 minutes, turning once halfway through cooking. Remove plums from grill; let cool and cut into 1/2-inch pieces. 4.In small saucepot, heat hoisin, onions, vinegar, soy sauce, ketchup, sesame oil and plums to simmering over medium heat; simmer for 20 minutes. Makes about 4 cups. 5.Turn all burners to medium-high heat. Brush ribs with sauce; turn and cook 2 minutes. Brush ribs with sauce; turn and cook an additional 2 minutes. Serve ribs with remaining sauce; garnish with onions, if desired. > Removing the thin, papery membrane on the underside of the ribs prior to applying a marinade allows a rub or marinade to penetrate the meat. To remove membrane from ribs, turn the ribs bone-side-up. With a sharp paring knife, carefully lift up the edge of the membrane from a corner of the slab. Work your fingers between the membrane and ribs to loosen. Grab the membrane with a paper towel and pull across the slab to remove.